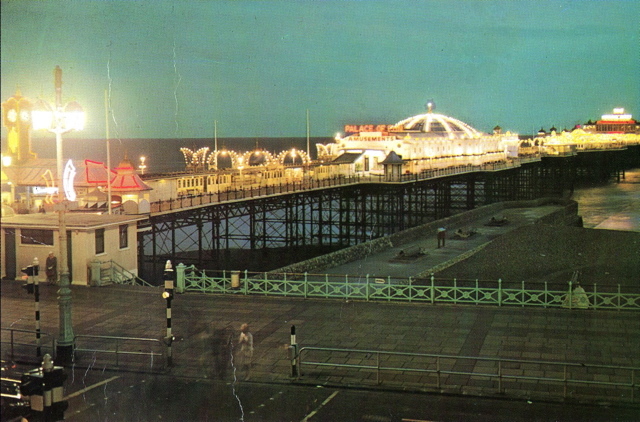 I think that this is a rather spooky view the Palace Pier; it was taken in the early 1960s. This night time view of the Palace Pier makes me think of an elderly lady who has fallen asleep and left all the lights on! Apart from a few shadowy figures on the breakwater and pavement there’s not a soul to be seen on what appears to be a very calm, still, summer evening. Perhaps everyone went home early after spending a long hot sticky day on Brighton beach? Or maybe it was the lull before the storm? I do remember in that era, most of the Palace Pier closed down mid evening. However, the lights were left on as part of the seafront illuminations, and also for the benefit of late night theatre goers. As a child in the 1950s, the Palace Pier was truly a magical place for me. It was certainly a world away from the theme park attraction it is nowadays. Looks like the photo was taken from one of the rooms of the Royal Albion Hotel? The photo is from a collection that belonged to my late sister. Peter is almost spot on, I’m pretty sure she once told me the shot was taken from the roof terrace of the Royal Albion Hotel. However, as it was many years ago I’m not absolutely certain. I am currently doing a project for university and am interested in learning of people’s past experiences with Brighton Pier. I would absolutely love to hear from anyone kind enough and willing to contact me with their memories. What I am looking at is how the pier has changed, both physically and in the eyes of the visitor (at 21 my memories only stretch so far!) If anyone is kind enough then my email address is sw273@sussex.ac.uk and I will be completing this project in the next few weeks.